Phanindra Narsetti’s Manu is buzzing with expectations in the film world. Considering that it is one the largest crowd funded projects down South, it is no surprise. With it release just hours away, it’s director speaks to us about his debut project and more. Why did you decide on Manu for your debut film? I decided to take on Manu because it is a very challenging story and I wanted to start my film career working on a project that will successfully make my mark from the beginning. It is \ a story I wrote seven years ago and at that point it was 45 minutes. It's a tough topic to deal with. Once I finished my short film Madhuram, I didn't want to take things easy and I found Manu as I was going through my previous stories. I was actually surprised that back then I wrote such a challenging script. By the time I made Madhuram my style became much smoother and aligned more with the trends. I wanted to go back to my roots with Manu. It is a surrealistic fantasy which developed over many years. You opted for crowd funding for Manu. Why? Crowd funding allows for more creative freedom and control. There is also no script tailoring. Prior to going the crowd funding way I approached quite a few major production houses, they liked it but it was getting delayed. Even Sudheer Babu had heard the script and was keen on making it a pan India project, to make it bilingually in Hindi and Telugu. I wasn't prepared for a pan project so I opted out of it. I owe him a sorry! Was it difficult to get the funding required? Genuinely speaking it wasn't difficult at all. It was fortunate for us. But there were a lot of problems during the shoot. We put up the set near a cement godown where we were swamped with mosquitoes. Every month four to five crew members were getting sick because of that. Imagine we were paying rent every month and so many days were wasted because of this issue. Would you recommend other directors to go for the crowd funding option? I would recommend it but they should have the credibility to back themselves. Everyone who funded Manu, sans two, were unknown to me. I believe they did it because they saw my previous work. I think without Madhuram there is no crowd funding for Manu. I think a fine credible short film is a must if you are attempting to crowd fund a project. Tell us about your short films. I’ve only done two short films prior to Manu. Backspace was the first and I believe it set a benchmark. Back then short films and the equipments used for them were still being figured out. We stood apart by using a 4S camera to shoot it and the film gave me the credibility to carry on. Once Madhuram came out it nailed it for me and I garnered a lot of backing from then. I also directed Her for Chai Bisket but that wasn’t my story. Did you study film making? Do you think it’s necessary? I’m a self taught film maker. I didn’t feel studying filmmaking was needed for me. I believe that creativity cannot be taught. And if it is to learn the theory or master the gadgets then in this era we can learn anything ourselves. When did you decide to get into the film industry? Decisions like that just happen. An Artist doesn't remember when he decided to use a particular colour because that decision grows with us naturally and unknowingly, like our skin. But if I were to pinpoint a certain period, I’d say 2005 was a tipping point. In my childhood I was rarely taken to films; I used to watch them on TV. But I read books. That’s when the stories used to form in my mind. In 5th or 6th standard my mind would compose these stories and play them out for me. In 2005 when I came to Hyderabad to study for MCET, the hostel had an open door policy so we were free to do as we pleased. I could go to any movie in the weekends and I ended up chewing up as many as possible. Back at the hostel I would tell these stories to others, narrating the exact stories or making improvements depending on what I liked. I loved doing that and getting reactions from others. I studied Pharmacy in Chennai from 2006-10. I used to talk more about cinema than the meds in my second, third and fourth years so it became clear to me that I would pursue films. I am a very academic person and I think that influences my filmmaking. Take for example Sukumar garu, he was a mathematics teacher so his films have that logical aspect. What are your expectations for Manu? I have no expectations. We poured our life into that film and it's a well made product so now I’m lying on my bed as I speak to you over the phone with no stresses. 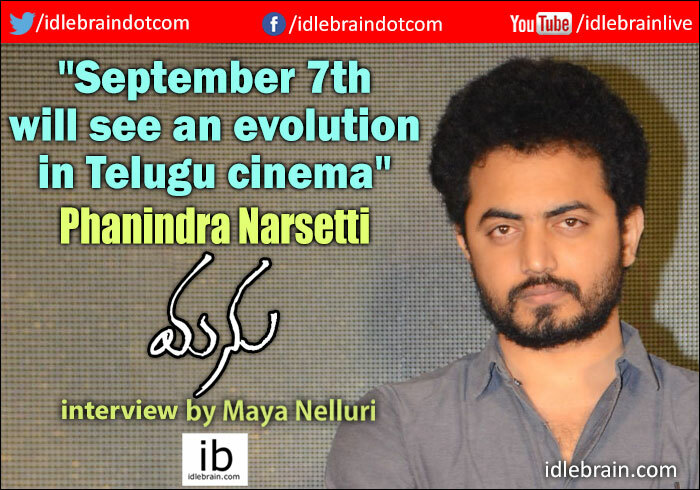 September 7th will bring about an evolution in Telugu cinema be it through Manu or C/o Kancherpalem. The team of Manu would like to wish the team of C/o Kancherpalem all the best!